We offer a collection of wine racks for all needs and applications. 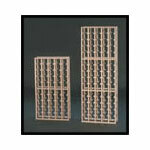 From a small wooden wine rack for the home, to large commercial wine racking systems. 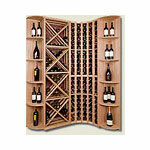 Our collection of racks for wine are attractive, durable and come in several designs. Each of these wine rack systems comes with instructions on how to build your wine rack, resulting in a finely customized wine cellar. Need help in building your cellar? Click here for Wine Cellar Construction Tips. Need help designing your cellar? Click here for helpful links. 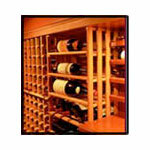 If you would like a cooling unit as well Click Here to shop for wine cellar cooling units. Comparison Chart below summarizes the differences between the racking systems. Our lowest cost per bottle for bulk wine storage. The Metal-Grid Wine Rack is practical, stylish and affordable. 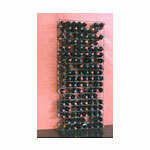 The Metal Grid 144 bottle wine rack features a black epoxy finish for a durable wine rack system. 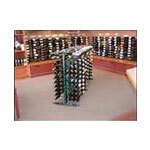 Freestanding metal retail wine racks designed for commercial and retail use. VintageView Island Display (IDR) and Point of Purchase (POP) commercial wine racks are specifically designed for maximum product exposure, easier consumer access and greater capacity in a limited space. No walls to attach racks? Want a glass wall with racks seemingly attached to it - Look at the floor/ceiling mount FCF. Free standing, label forward Wine Racks. A wine holder for every need and design style. Our specialty wine racks offer a tabletop wine rack, wall wine racks and so much more. We work with you to create a custom wine racks that will fit your design preferences and collecting style. Everything is created especially for you. 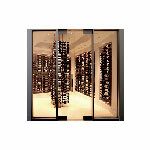 The result provides a showcase wine cellar for your prize collection. Check out our Custom Wine Cellar Gallery for some of our past wine cellar designs for ideas. Your Wine Deserves the Very Best Home! and Rosehill is here to help. Anodized Aluminum wine racking available in a variety of colours to suit any décor. For helpful information about creating/designing your own wine cellar, please visit the Designing Your Wine Cellar page. If you would like a cooling unit as well click here to view our collection of Wine Cellar Cooling Units. Our racks for wine are available for shipping in the United States of America and Canada. For more details and pricing, please see one of the fine manufacturer's above. Some racking is a stock item and readily available for shipping. Other systems average 2-3 week lead time. Custom Racking will take longer. Wood Wine Racks - Why choose one system over another? Many different species of wood and finishes available. Racking Depth: Total 9"- rack is 6 1/4"
Brackets hold it 2 3/4" away from wall. 13 1/2" 13 1/2" From 4"
Thickness: 1/2" x 1 3/8" 11/16" x 1 1/2" 11/16" x 1 1/2"
Cost: Low Moderate Expensive High moderate. Low cost - Means you have more money for wine! Variety of heights available, you can easily stack. Rosehill can custom cut some of the racks in height and/or width for a customized look - Wall to Wall/Floor to Ceiling continuation. You can also achieve a custom look with your own built displays, table tops, crown molding & baseboards. Neck of the bottles are submerged. Angle Display in many racks. Same depth & thickness as most custom. You can cut width of many racks to allow for wall to wall custom fit. Floor to ceiling, wall to wall continuation of racking and display elements. Neck of bottle is submerged. Custom designed based on needs and wants of the customer. Modern design in brushed metal or black. Cost per Bottle: From $0.54 to $1.54 USD per bottle. From $2.70 to $5.20 USD per bottle. Custom racking is higher price per bottle. From $4.29 per bottle. When it comes to Wine Racking, it can sometimes be difficult to decide which style would work best to house your collection of fine wines. Not to fear, here at Rosehill Wine Cellars we offer a variety of types of wine racking that will surely compliment your space. Whether you are looking for small wooden wine racks to fill a residential cellar, or larger wine racking systems for a commercial or retail space, Rosehill is the place to visit for your racking applications. In addition to our Modular Redwood wine racks, we also offer custom made wood racking that can be adjusted to suit your space. In terms of our metal wine racking options, we have a variety of wall-mounted as well as stand-alone island wine racks that are great alternatives for displaying your wine. For lowest cost per bottle bulk wine storage, we offer a wall-mounted Metal-Grid wine rack that is very stylish and affordable. For optimal display of your collection, our VintageView Wine Racks and (POP) Point of Purchase wine racking systems are a great choice, since they are specifically designed for maximum product and wine label exposure in a limited space. Looking for a smaller scale racking display? Feel free to browse through our great selection of specialty wine racks that are designed to display your wine in a unique way. While many of these racks are much smaller in size and are freestanding, they are still a great option for showcasing your wine. So, you are building a new wine cellar…The style of wine racks used in your wine cellar is essential to establishing the look you want for the overall cellar and function of your collecting style. Wooden Wine Racks, which are Rosehill’s most popular choice of racking, are great because they can be easily custom-made to suit the space you are looking to fill. Rosehill offers a variety of Wooden Wine Racks that can be easily manipulated at a reasonable cost. While many Wooden Wine Racks come in a standard height of either 6ft or 7ft, they can be cut and/or stacked to fit a variety of ceiling heights depending on the type of Wine Racking needed. 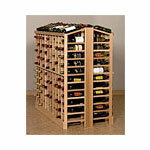 Because of their stackable feature, RedRack Redwood Wine Racks can be easily installed in cellars with varying heights. While Rosehill offers a variety of styles, in terms of custom racking suitable for residential needs, Rosehill also offers Retail Wooden Wine Racks that can be used in commercial settings as well. These Wooden Wine Racks are often free-standing wine racks that are specifically designed for a retail sales environment; having display perches, or space for Point of Purchase (POP) materials. While these Wooden Wine Racks come in a standard size, our sales representatives would be more than happy to discuss any possible racking alternatives. The customization of our racks will allow for the possibility of wall-to-wall and floor-to-ceiling designs. Standard racks come in European Beech, Sapele (African Mahogany) and Toasted Maple. Custom Wine Racks are available in a variety of woods as well.